I have been coaching Entrepreneurs on How to Raise Investment from Venture Capitalists, Angel Investors and Friends, and Family for many years. This book is my way of reaching out to a larger audience around the world that I can reach through my 1-on-1 and group coaching. My goal with this book is to have a measurable impact on the success rate of Entrepreneurs raising investment capital and for Investors to waste less time with ill-prepared Entrepreneurs. I spent several months in 2018 doing my research and writing this book. As an Entrepreneur and Electrical Engineer, I’m all about the process. I spent countless hours researching not only for the best way to share my information in the book with both Entrepreneurs and Investors but also how to correctly format the book for paperback and Kindle eBook printing. This education was well worth the time as I now have a documented process for writing and publishing both paperback and eBooks. This will allow me to more quickly write and publish future books in this series and on other topics. My expertise in writing this book comes from my 25+ years in Silicon Valley. My first company we started way back in 1983 and took to IPO in the middle of 1986. After that, I went on to start several other ventures, the last one I led my team to raise over $87M USD through three rounds of funding from large Silicon Valley Venture Capital firms. 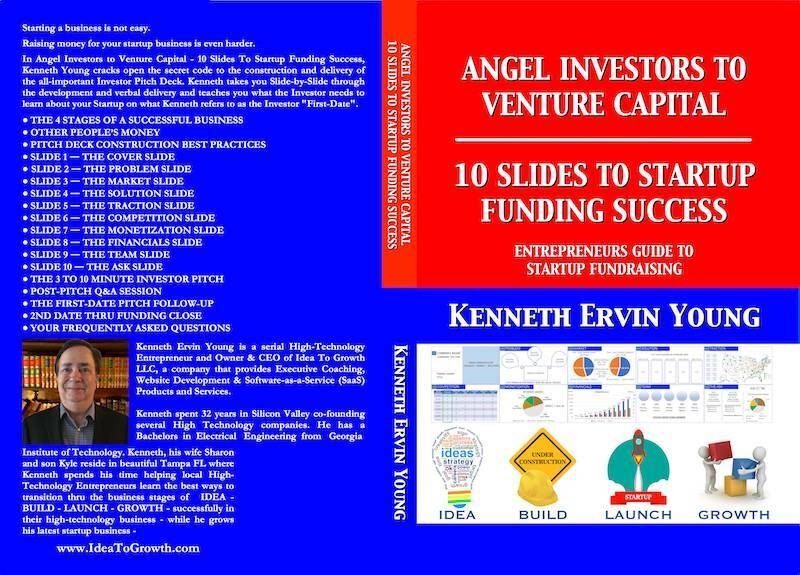 “Angel Investors to Venture Capital - 10 Slides to Startup Funding Success - Entrepreneurs Guide to Startup Fundraising” FIRST SALE DAY was January 22nd. I chose January 22nd as it is my birthday and in addition to the cruise my beautiful and wonderful wife is taking me on, I wanted an easy day to remember this book launch. The paperback version is 298 pages of education. In each chapter covering each of the 10 Slides, an Entrepreneur will learn how to create each slide through both words and images of good and bad pitch slide examples. At the end each chapter related to the ten-pitch slides I include an executive summary and a slide creation checklist - to make it easy to be sure that you don’t leave anything important out - and to be sure to are not tempted to add things you should not include on the slide. Other chapters cover topics which include how to prepare for Meeting with Investors, Preparing for Investor Pitch Events, Investor 1-on-1 “First Dates” and follow-on “Investor Dates”. Throughout the book, I also include links to the various website that can provide additional helpful information. Some of these links are to my own website. For those who want to save endless hours setting up a presentation template, I offer a set of templates for PowerPoint, Google Slides, and Apple Keynote. The templates follow everything I teach you in the book. Trust me, you’ll be glad you got these templates to help you create a killer Investor Presentation. That is a lot of material, but it covers all the key topics that both an Entrepreneur and an Investor should be looking to discover when looking to get or make a startup funding investment. That’s right, this book is also written to help investors! How? Two ways. First, they should make this book required reading and implementation prior to agreeing to meet with an Entrepreneur to learn about their company. Investors who have been around the block a few times hate seeing the same mistakes made by Entrepreneurs repeatedly. Second, and this is more for the Angel Investors, learn from this book what you should be expecting from Entrepreneurs at first, second and third “Date”. If an Entrepreneur can’t give you great answers to all of the questions my book suggests you should be asking, then likely this Entrepreneur is not ready for your investment. This book covers all of the “guts” of what I teach in my $2500.00 1-Day Investor Pitch Coaching Course. Some said I should only sell this book as part of my Coaching Course. Well, I disagree. As I said earlier, I wanted to be able to reach out to everyone with this book. The paperback version is going to have a "regular price" of $39.99 on Amazon. The eBook version is going to have a "regular price" of $9.99 on Amazon. So for less than $40 USD, you’re going to be able to learn from an Entrepreneur whose companies raised over $100M USD. You’re going to be educated on what I learned the hard way - without you making all the mistakes that I did. The advice that I got from Venture Capitalists on what they need to know - and what they don’t want to hear about. I hope you’ll agree that this education is worth multiples of these prices. But I’m going to give you what likely will be a “ONE-TIME DEAL”. In order to get the strongest launch possible, I am going to offer the eBook version at a ‘ridiculously’ low price. SHHH! SEE LINKS BELOW FOR SPECIAL eBOOK PRICING! SHHH! SEE LINKS BELOW FOR SPECIAL PAPERBACK PRICING! Plus, I have a SPECIAL BONUS for PAPERBACK BUYERS. If you buy the paperback, you can download the Kindle version for only $0.99 USD directly from Amazons Free MatchBook program! So if you buy the paperback version, you’re getting nearly $50 USD worth of my book for over 50% off! LEAVE ME A REVIEW ON AMAZON! Book sales are heavily influenced by the Total Number of Reviewers AND the number of 5-Star Reviews. Now I’m not asking you to leave me a 5-Star review - unless you think the book deserves it - But I’m hoping you will agree that it does! Some of you will think there is more I should have added to this book. Well, if you are willing to email me at Ken at IdeaToGrowth.com, there’s a good chance I’ll include your ideas in the Second or Third Book in the Series. Please share your ideas, but please don’t take stars away because I stopped writing at just shy of 300 pages! Massive Time-Saver Investor Pitch Deck Template Bundle! The 10-Slide Investor Pitch Deck should be made using a template so that there is a professional look-and-feel from page to page. Unless you are a PowerPoint, Google Slides or Apple Keynote Expert, making a template can be countless hours, or even days, of frustration. Because of this, most of you won't use a Template. You will make each slide individually. Some of you will make one slide then "copy" it ten times to try to have a common look and feel. This method really doesn't serve you well. First, when you want to change a border color, embedded logo, font family, text color, text size - you have to go through each and every slide and make the same changes repeatedly - and hope you don't miss any. Trust me, you will. A Template solves that challenge. With a template, you set up your border shapes and colors, embed your logo and tagline once, set the font-family and size once. Every new page uses all of the template settings to maintain that professional look-and-feel you want. Plus, when you inevitably want to change a border shape, color, font or your logo, you simply update the master template page and, like magic, all of your pages in your slide deck are updated! I'm a devout believer in choice - and making things easy! So, I've made hundreds of templates from which you can choose. Dozens of color choices. Many different layouts. Focus on Images – Not Words! I have special pricing for my book buying customers right now during my book launch. $291 USD ONLY $47 USD! It would take most of you more than a full day to create just one of these templates. Isn't a day of your time worth $47 USD? Lifetime FREE Updates to the Templates. I expect to regularly add to these templates so as new design patterns are created you will get them at NO EXTRA CHARGE! Index Feature for Backup Slides. You will learn in my book that although you will present only ten slides, you should have over 100 backup slides. Most Entrepreneurs have these backup slides scattered throughout multiple files or all lumped haphazardly together into a single file. When an investor asks you a question, you start madly looking for that one backup slide. The investor rolls their eyes. My Templates Index Feature Bonus solves that challenge for you. Slide #11 is the "Master Index" slide that will enable you 1-click access to any backup Subject Index - Marketing, Sales, Product Development, Employee Background, Incorporation Details, and more. Each Subject Section has its own Subject Index page of links to each page within its section. I start you with examples of pages you should consider having for each Subject Index, but since I give you a ton of samples, you'll quickly see how easy it is to add your own slide index content to each section. You are never more than 2-Clicks away from any backup slide. Super professional presentation! I've set it all up for you. Plus, every slide has a "Back Button" to pop you back to the Subject Index, then back to the Master Index (Slide #11). People who have used my Investor Pitch Deck Template have told me the Index Feature for Backup Slides alone is worth the price! Again, Thank you for your time and consideration!